The end of Daniel 11 provides surprisingly intricate detail with respect to the Antichrist's personality and military engagements. Most of Daniel 11 discusses a series of past military prophecies, a past "abomination of desolation" event, and a past evil ruler: Antiochus IVEpiphanes. Nevertheless, the prophecies of Daniel 11:1-35 are so accurate that non-Christian theologians incorrectly date the entire book after the events it describes. However, starting in verse 36, the prophecy continues, but no longer has any relevance to historical events. In short, there's a major "dropoff" starting at verse 36. Everything before verse 36 was fulfilled exactly in history. But through the remainder of the chapter after verse 35, there is no historical relevance to the verses. We know (based on cross references and end times terminology), that the person described in verses 36-39 is very clearly the Antichrist. We also know that the Antichrist originates from a revived Roman Empire, most likely from the European continent. See my justification for this here. He will provide economic and leadership rewards to those who support him. However, the text proceeds to provide a very detailed account of the Antichrist's military encounters. Here, the text says that the Antichrist is specifically invaded by a King of the North, and a King of the South. Throughout the beginning of Daniel 11, the King of the South always referred to Egypt. Therefore, there is no reason to doubt that the King of the South is Egypt. Unlike Egypt, the Seleucid empire does not exist today. Therefore, prophecy scholars are divided as to the identity of the Kingdom of the North. Many have suggested a stronger northern force (such as Russia), since the Seleucid empire does not exist anymore. (3) Others have said the kingdom of the north is Syria. After all, the Seleucid empire was also referred to as the "Syrian Kingdom." A third option is that Syria and Russia are both in an alliance that represent the "king of the North." 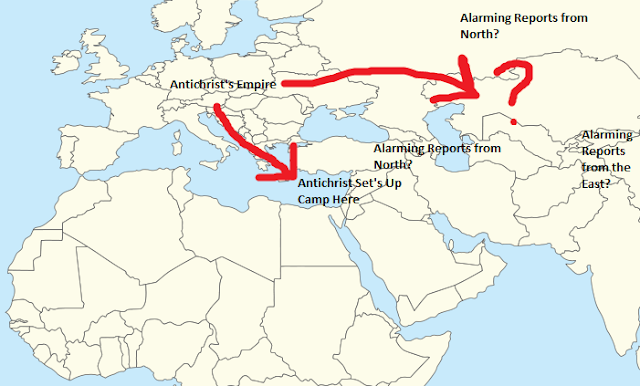 Therefore, the very first military encounter that the Antichrist has appears to be a two-front invasion, one from Egypt and from the Russo-Syrian alliance. Even though the Antichrist is known as a ruthless military conqueror, he does not throw the first punch. He acts opportunistically, using the attack against his empire as a pretext to attempt to annihilate everyone else...including Israel. And he shall come into countries and shall overflow and pass through. He shall come into the glorious land. And tens of thousands shall fall, but these shall be delivered out of his hand: Edom and Moab and the main part of the Ammonites. I think it's safe to assume he will retaliate against Syria and Egypt. This is actually very historically significant, since the "prototype" of the Antichrist (Antiochus IV Epiphanes) made a very similar military gesture in the past, before setting up his own "abomination of desolation" in 168 B.C. After fighting in Egypt, Antiochus went to Israel to set up the very first "abomination that causes desolation." A very similar event will happen with the Antichrist. The passage implies that the Antichrist will retaliate, and sweep through many countries like a "flood." He will also invade the "glorious land," which is a term for Israel. It is likely that he will set up the end time "abomination of desolation" when he invades Israel. Even though he attacks several nations, Edom, Moab, and Ammon (modern day Jordan) are exempt from his attack. This is likely the location where Jews will take refuge in the desert for 1260 days (Revelation 12). This will take place after they flee to the Judean mountains because of seeing the end-time abomination that causes desolation (Matthew 24). The passage continues and states that the Antichrist will gain control over certain North African regions. 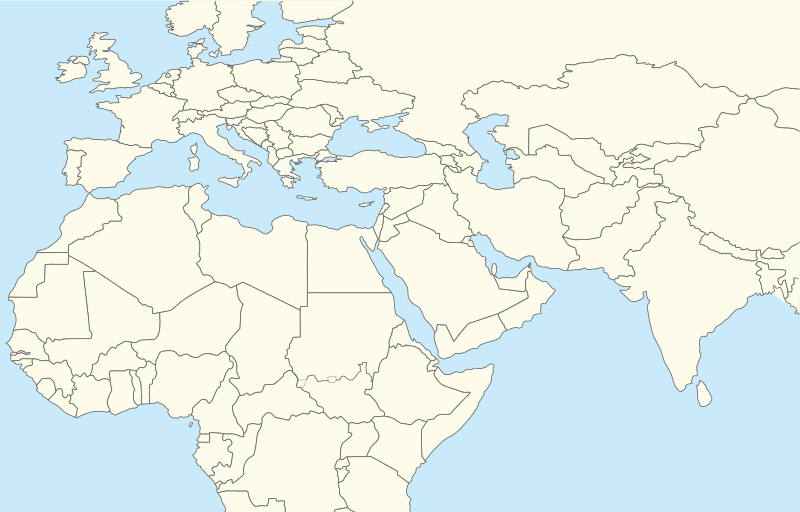 From what I can tell, these North African nations roughly correspond to Egypt, Libya, and Ethiopia. This is why the map above has the Antichrist "sweeping through" North African nations, Syria, Egypt, and eventually Israel. Recall, in Revelation 13, that people say: "Who is like the beast? Who can wage war against it?" Here, the Antichrist will discover that things are no longer so easy for him. He will discover that northern forces (Russia? Syria? ), and eastern forces (China? India?) will likely pose a threat to him. This will cause him to "destroy" and "devote many to destruction." Here, it states that the Antichrist will make camp between the sea and the glorious holy mountain. It is also interesting to note that the plain of Megiddo or "Armageddon" is located in that area as well. This verse likely refers to the Antichrist gathering at Armageddon. Nevertheless, the passage states that the Antichrist will come to his "end." It does not necessarily state he will die. According to Revelation the "beast" is thrown into the Lake of Fire. The Seleucid Empire in 200 BC. Author: Thomas A. Lessman. Source URL: http://www.ThomasLessman.com/History/images/East-Hem_200bc.jpg. Image was created by me (Thomas Lessman) based on my map of Eastern Hemisphere in 200 BC.